Tonight's dinner was a take on a Bon Appetit recipe from the April 2013 issue. 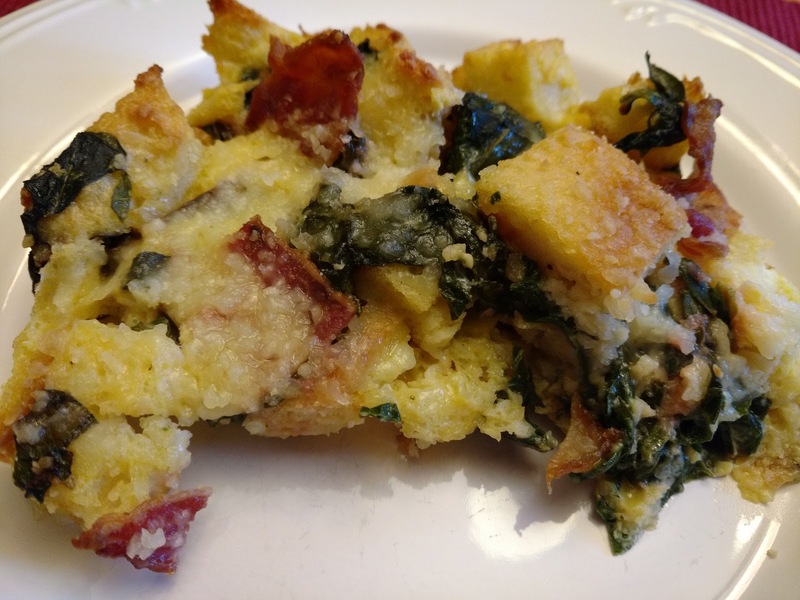 The original recipe was Parmesan Bread Pudding with Broccoli Rabe and Pancetta. Chris is not a fan of Broccoli in any form and I had the bacon already in the fridge. This was tasty. It was like a deconstructed Bacon and Egg Sandwich. I cut the recipe in half. Below is the original recipe from Bon Appetit. Preheat oven to 350°. Heat oil in a large skillet over medium heat. Add garlic and red pepper flakes. Stir until garlic is softened, about 30 seconds. Add broccoli rabe; season with salt and pepper. Cook, tossing, until wilted, about 2 minutes; let cool slightly. Meanwhile, whisk eggs, milk, 2 teaspoons salt, and 1/2 teaspoons pepper in a large bowl to blend. 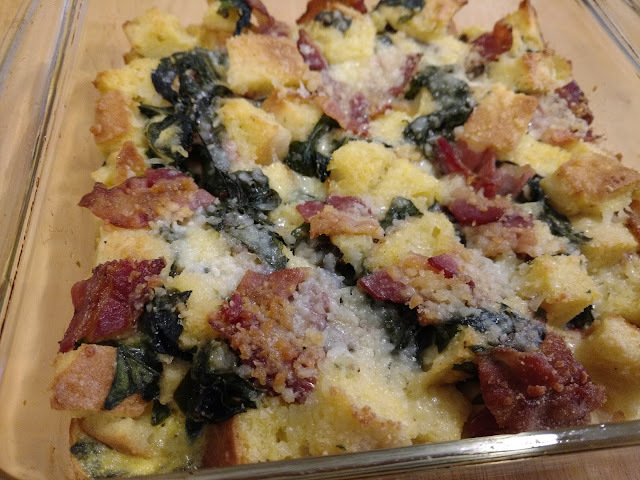 Add broccoli rabe mixture, bread, and 1/2 cup Parmesan; toss to combine. Transfer to a 1-1/2-Qt. baking dish. Top with pancetta and remaining 2 tablespoons Parmesan. Bake pudding until puffed, browned in spots, and set in the center, 45-55 minutes.